Seventeenth Post: NPCs Hedonists best grab their forks and gags then get in line for Slaanesh! Today’s Post: NPCs Deception, sorcery, and mastery over fate is what’s in store for today–TZEENTCH-time! Aura of Fear. Creatures within 60 feet of the Disc of Tzeentch must succeed on a DC 16 Wisdom saving throw or become frightened for 1 minute. A creature can repeat the saving throw at the end of each of its turns, ending the effect on itself on a success. 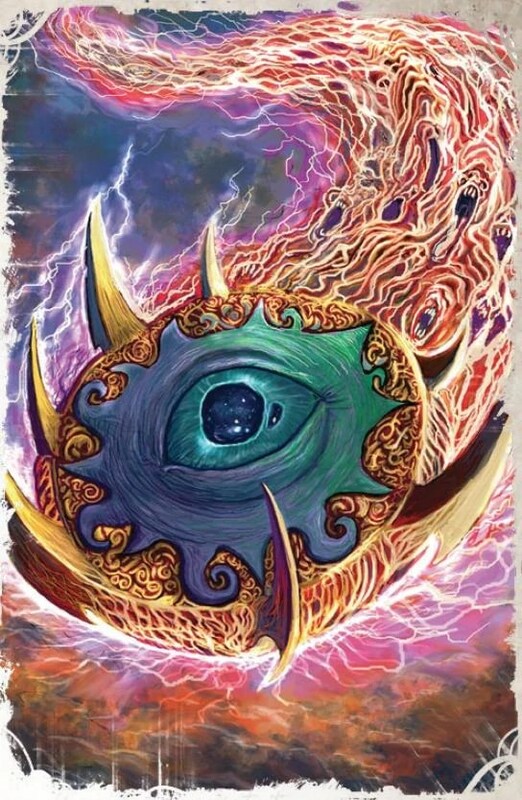 If a creature’s saving throw is successful or the effect ends for it, the creature is immune to the Disc of Tzeentch’s aura of fear for the next 24 hours. 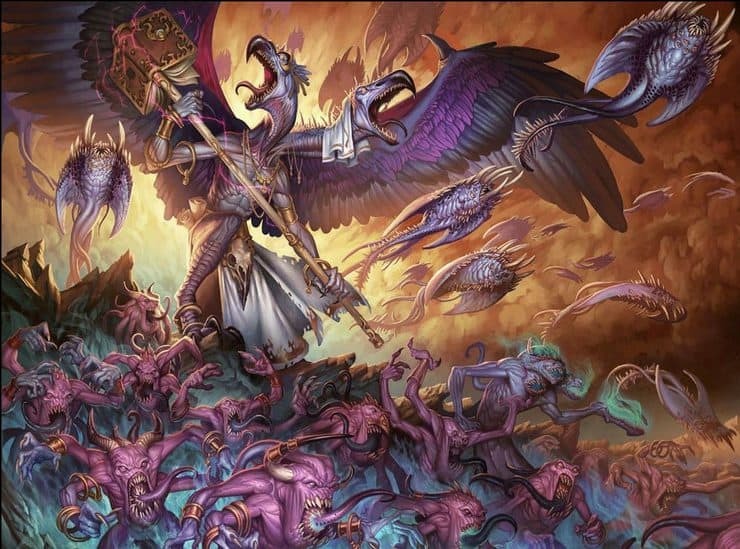 Blessing of Tzeentch. The Disc of Tzeentch is protected by the power of the Changer of Ways. Whenever the Disc of Tzeentch would take damage, it takes 15 less damage. Daemon Aura. Hostile creatures within 60 feet of the Disc of Tzeentch have disadvantage on Wisdom saving throws and saving throws against fear. Daemonic Mount. A Disc of Tzeentch is a screamer bound by a psyker to be their mount. While being used as a mount, the Disc of Tzeentch is able to to use its actions normally while its rider is in control, any attacks targeting the rider have a 50% chance to strike the Disc of Tzeentch instead, and the rider is protected by its Blessing of Tzeentch feature. When the Disc of Tzeentch takes damage, the rider must succeed on an opposed Charisma saving throw or the creature changes back into a screamer (use the statistics for a Cloaker with the fiend type and an alignment of chaotic evil) and attacks the nearest living creature (likely the rider). Heightened Senses. The Disc of Tzeentch has advantage on Wisdom (Perception) checks. Magic Resistance. The Disc of Tzeentch has advantage on saving throws against spells and other magical effects. Multiattack. The Disc of Tzeentch attacks three times. Warp Blades. Melee Weapon Attack: +8 to hit, reach 10 ft., one target. Hit: 13 (2d8+4) magical slashing damage. Daemon Aura. Hostile creatures within 60 feet of the Lord of Change have disadvantage on Wisdom saving throws and saving throws against fear. Eyes of Fate. When a creature that can see the Lord of Change’s eyes starts its turn within 30 feet, the Lord of Change can spend their bonus action or reaction to force it to make a DC 18 Wisdom saving throw if they aren’t incapacitated and can see the creature. If the saving throw fails, the creature is frightened for 5 rounds and gains a short-term madness. If the saving throw fails by 5 or more, the creature also gains a long-term madness. If the saving throw fails by 10 or more, the creature also gains an indefinite madness. Unless surprised, a creature can avert its eyes to avoid the saving throw from this feature at the start of its turn. If the creature does so, it can’t see the Lord of Change until the start of its next turn, when it can avert its eyes again. If the creature looks at Lord of Change in the meantime, they may spend their reaction to cause it to immediately make the saving throw. Magic Resistance. The Lord of Change has advantage on saving throws against spells and other magical effects. Morphing Form. The Lord of Change is immune to any spell or effect that would alter their form unless they are the origin of that spell or effect. Sublime Magician. The Lord of Change is able to simultaneously concentrate on two spells (instead of one). Multiattack. The Lord of Change attacks four times. Beak. Melee Weapon Attack: +9 to hit, reach 15 ft., one target. Hit: 13 (2d8+4) magical piecing damage. Claw. Melee Weapon Attack: +9 to hit, reach 15 ft., one target. Hit: 11 (2d6+4) magical slashing damage. Staff of Change (10 charges). Melee or Ranged Weapon Attack: +9 to hit, reach 20 ft., one target. Hit: 11 (1d8+7 magical bludgeoning damage. The Lord of Change can expend 1 charge as a bonus action, converting hit dice into an equal number of spell levels. When the Lord of Change dies or expends the last charge, roll a d20. On a 1, the staff becomes a nonmagical quarterstaff. On a 20, the staff regains 1 charge. On any other result, the Staff of Change releases its remaining magic in an explosion that fills a 50-foot-radius sphere centered on it. Creatures in the area must make a DC 18 Dexterity saving throw. A creature takes 45 (10d8) force damage on a failed save, or half as much damage on a successful one.